Silly me, I always thought it was those evil white people who cut down trees and then turned them into farms. I didn’t realize the opposite was true. It turns out that Native Americans had huge farms and white people screwed this all up by getting rid of the farms and, gasp, replanting tree. So many trees that the result was a huge reduction in carbon dioxide resulting in world-wide global cooling. How irresponsible can you get? That, folks, is what really caused the mini-ice age. This is even more shocking when one reflects on how Native Americans farmed before Europeans arrived to screw things up. Native Americans got their food by: hunting and fishing, gathering, farming and raising domesticated animals. They used advanced tools like stone axes, flint arrowheads, pointed sticks and shovels made out of bones. Before Europeans arrived, they didn’t have horses, oxen etc., so the domestic animals would be things like turkeys, ducks and dogs. In South America, they also had llamas and guinea pigs. Yet they still managed to out farm those lazy Europeans by a huge margin. Oh, there’s one more little thing. The Sun just isn’t cooperating with this global warming crisis. The following chart is from the Met Office and the University of East Anglia Climatic Research Unit. You know them. They are the people who have been giving you all those dire global warming predictions. 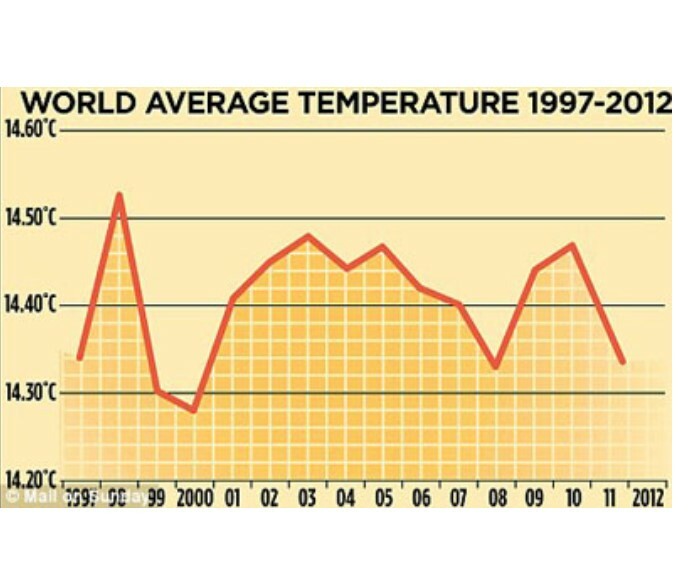 They produced this chart, but then ignored it because actual temperature readings, well just don’t measure up. While the New York Times and CNN have been telling you all about the record high temperatures over the last 15 years, actual temperature readings from these politically incorrect thermometers tell a very different story. Of course this data is only based on 30,000 monitoring stations while the record heat has been verified by a tourist in Central Park wearing a watch with a built in temperature gauge. True believers still think impact of the sun on climate is far less than man-made carbon dioxide. They agree that the sun’s output is likely to decrease until 2100 as a result of a reduction of solar activity to levels not seen in hundreds of years, but they don’t think this will be sufficient to offset the dominant influence of greenhouse gases. You can conduct a simply experiment to prove this theory correct. This summer, when the temperature is over 100 degrees, move away from the shade and lay out in the direct sun. Then breathe out as much carbon dioxide as you can. That will make you so much cooler than if you stupidly stayed in the shade.